This report deals specifically with olive oil, harmonized code: 1509. It covers Untied States sources of olive oil and imports of Spanish olive oil from the last five years. We conclude with a comprehensive list of U.S. companies importing Spanish olive oil. The United States is the second largest olive oil importer in the world. They spent 1.6 billion dollars on foreign olive oil in 2009. For a profile of the world’s largest importers and exporters of olive oil, click here. They import 88% of their olive oil from three countries: Italy, Spain, and Tunisia. For a comprehensive list of companies importing olive oil from Tunisia and trend click here. 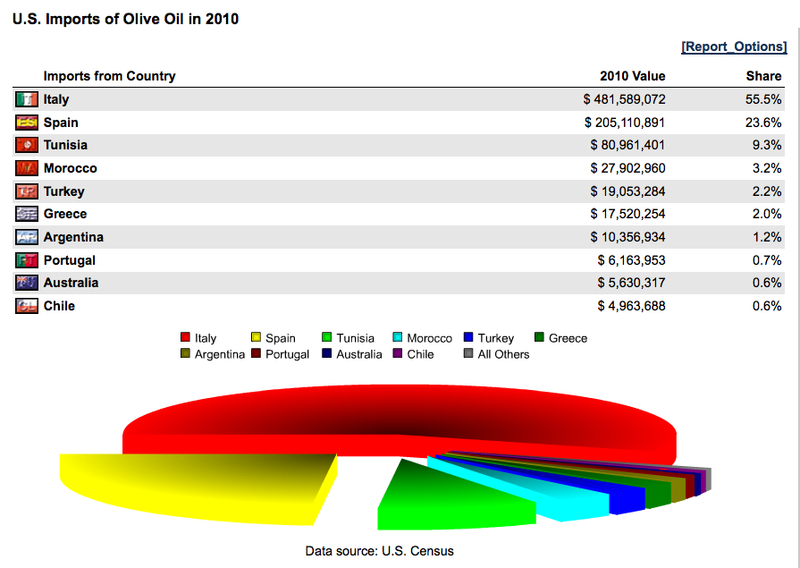 Below is a 2010 ranked list of the top countries from which the United States buys olive oil. The pie chart represents market percentages of imported oil from each specific country. Spain is represented by the yellow slice accounting for 23.6% of Untied States imported olive oil. Spain provides a pretty steady source of olive oil to the States. 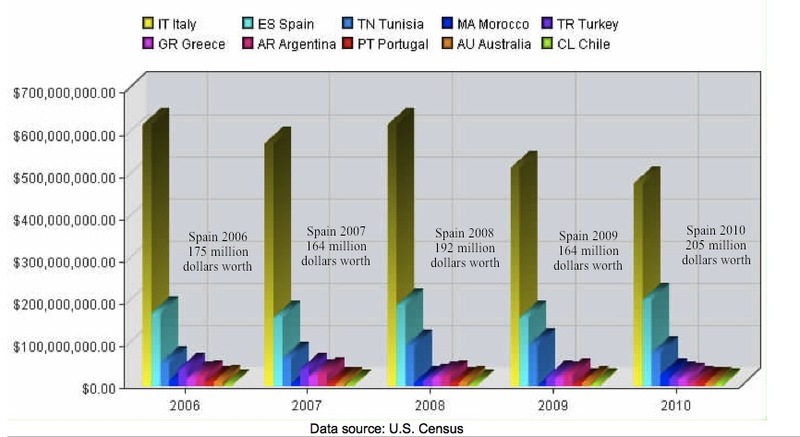 In 2006 the U.S. imported 175 million dollars worth from Spain. In 2008 they imported 192 dollars worth of Spanish olive oil. In 2010 they imported 205 million dollars worth. Below is a histogram / bar chart-graph representing the last five years of Spanish exports of olive oil to the United States by dollar amount per year. Spain is represented by the turquoise bar in the graph. While the amount fluctuates, Spain has maintained the strong position of second largest olive oil source to the United States for the last five years with only Tunisia even coming moderately close. United States Companies Importing Spanish Olive Oil. Part of the reason Spain has maintained its strong position of second largest source of olive oil to the States is the American companies importing it. With PIERS we can view a comprehensive list of American companies importing Spanish olive oil. While Tunisia is unique in that it only has a handful of companies importing its olive oil, Spain has over one hundred and fifty U.S. companies importing it. Included below is a sample list of fifty of the one hundred and seventy United States companies importing Spanish olive oil. For a full excel list of these companies, with location, employment, president, etc. click this link.